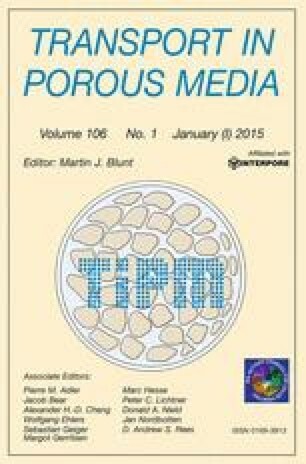 This article investigates the multiphase flow in a porous channel, heated at one section of the wall. For non-isothermal flow with phase-change, a finite-volume solver in MATLAB® is used with a two-phase mixture model with local thermal non-equilibrium , i.e., allowing for different solid- and fluid temperatures locally. The effect of gravity is examined for aiding and opposing flow. The effects of Stanton number of evaporation, Rayleigh number, Péclet number and Biot number on fluid flow and heat transfer for steady case are discussed. For these characteristic numbers and aiding flow, the largest influence on the local shift of the biphasic zone is with Stanton number, Péclet number and Biot number. The minimal saturation in the domain is correlated with increasing Stanton number, Péclet number or Biot number. The Rayleigh number, however, has an opposite effect on minimal saturation. The displacement effect of generated vapor is discussed for high Stanton numbers, Péclet numbers and Biot numbers. Also, we show that for sufficiently high heat input, opposing flow yields large differences in position of the biphasic zone and minimal saturation. Applicability of local thermal equilibrium for cases with phase change is shown to introduce a large error, not only for small Biot numbers or large Reynolds numbers.